Anyone who knows me well knows that I am hopeless when it comes to trashy television dramas. The O.C., Gossip Girl, Scandal– I’ve watched them all. One of my current guilty pleasures is the show Nashville, which my husband refuses to sit through because in his words, “All the men look the same, and I can’t tell anyone apart.” I have to admit, he’s kinda right; however, I’ll watch Connie Britton in just about anything, so I keep tuning in week after week. Now that the last season is over and my TV has gone dormant for the summer, I’ll have to get my romance and country music fix elsewhere- which brings me to this week’s film The Thing Called Love (DVD/Download). If you haven’t seen it, this Peter Bogdanovich 90’s classic is essentially what Nashville the TV show wishes it could be. No gimmicks, no flashy Christina Aguillera-casting, just good music and hot guys. Hello Music City! The Thing Called Love follows young singer-songwriter Miranda Presley (no relation) on her journey from New York to Nashville. Between waiting tables at the Bluebird Café, spontaneously marrying bad boy musician James (played by River Phoenix, in his last completed film role) and rooming with a young Sandra Bullock at a disco-themed motel, she learns what it takes to write a great song. 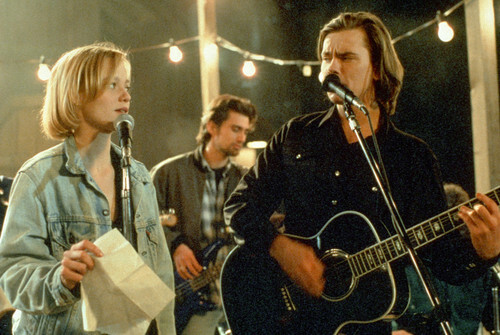 The songs for the film were written by stellar real-life country musicians, and actually performed by the actors themselves (a rarity in Hollywood). River Phoenix is so charismatic in his role, and it’s truly heartbreaking to realize this was the last one. Like James Dean in Rebel Without a Cause- you watch wondering all the while what might have been. My sources tell me that one of the essential drinks in Nashville is the Bushwacker. Originally invented in Pensacola, FL, bars of Nashville have somewhat adopted it as their own. This is a great one to sip as the weather heats up, and perfect for the film because you know Linda Lou Linden was downing these every night. Actually, her beauty pageant dress kind of reminds me of this white frothy concoction. While watching The Thing Called Love, I recommend drinking a Bushwacker. Pour liquid ingredients into a blender with a cup of crushed ice, and blend until mixed. Pour into a glass, then top with whipped cream and a cherry. There are a lot of variations of this drink, so feel free to add in Amaretto, Vodka, and/or Baileys Irish Cream, depending on how boozy you like your beverages (this could turn into the Tennessee version of last week’s Long Island Iced Tea if you really wanted it to). I’ve never actually been to Nashville, but this movie (and this drink!) make me want to go. Don’t worry though, I’d never be drunk enough to shout from rooftops or audition at the Bluebird. The ears of Nashville are safe. Cheers! 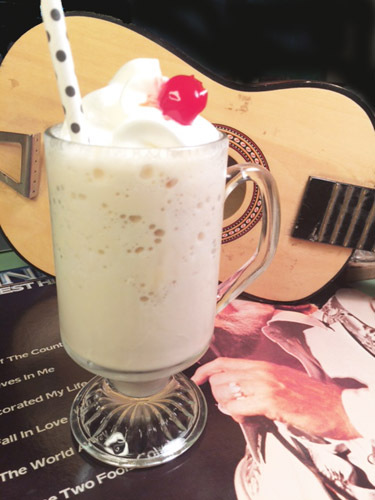 Posted in Dramas, Musicals and tagged Bushwacker recipe, Nashville, Nashville cocktail, Nashville music, Peter Bogdanovich, River Phoenix, Samantha Mathis, Sandra Bullock, The Thing Called Love. Bookmark the permalink.